With the power shortage taking the front stage in the media and in the new government’s pronouncements, an even more important issue has been relegated to the back burner. This serious issue is the future availability of water to support food production in Pakistan. To put it simply, while we can survive with power shortages, we cannot survive without food. Thus, the criticality of water required for agriculture is even greater than that for power. While lack of water for domestic use gets attention due to the immediate impact it has on daily life, availability of water for agriculture is brushed under the rug and deferred as there is still enough food to feed the population. This assumption – that sufficient food will be available to a growing population somehow – is closing the eyes to the hard facts relating to the water resources of Pakistan. The Indus Water Treaty (IWT) signed with India in 1961 under the aegis of the World Bank stipulated that the flow from the three Western rivers (Indus, Jhelum and Chenab) will be for the exclusive use of Pakistan while the three Eastern Rivers (Ravi, Sutlej and Beas) will be for India’s use. The above figures show that we are close to using all the water. The only additional water that can be made available is 23MAF. To utilise this water, dams need to be built to store it and use it as required. The storage capacity in dams in 2011 stood at 12.1MAF. No new dams have been built in Pakistan since the completion of Tarbela in 1976. 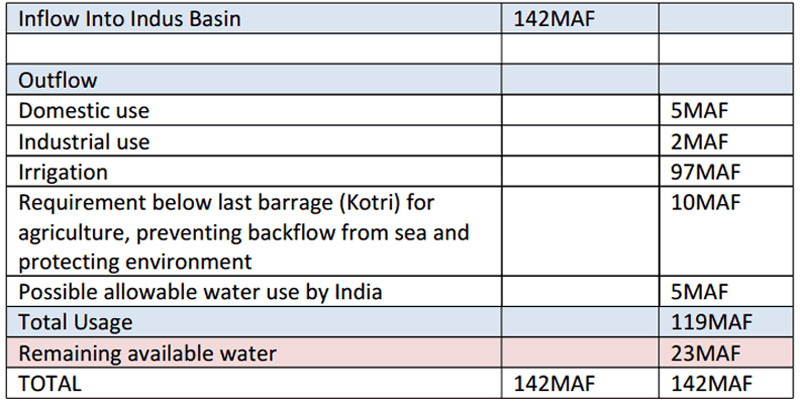 Also, the capacity of the existing dams (that was 16.7MAF in 1976), will go down to about 9MAF by 2025 due to silting. There are two projects under construction that will add an additional live storage capacity of 9.3MAF by 2025. These are the raising of Mangla Dam (added capacity 2.9MAF) and the Diamer-Bhasha dam (new capacity 6.4MAF). One practice that is already causing serious problems is the indiscriminate and excessive use of groundwater (this is the surface water that seeps through the ground) through nearly 1 million tube wells. Groundwater contributes an average of 45 per cent of the total irrigation requirement. While the use of groundwater has greatly profited crop production, the rapid rate at which it is being used is causing serious issues of lowering of the water table and salinity in areas where the water is over-drawn and water logging in areas of below optimal withdrawal. The current population of Pakistan is about 173 million and forecasted population for 2025 is 225 million. This is an increase of 30 per cent. Compared to the increase in demand, the additional water available is 19 per cent of the current use. Obviously, this situation would be become much worse by 2050 when the water supply could remain the same, while the population increases to 395 million. 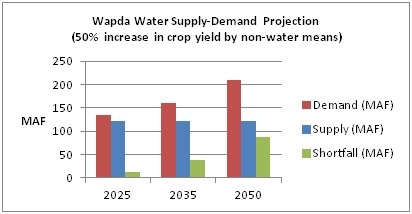 Wapda have thus assumed a 50 per cent increase in crop yield by non-water means to arrive at a demand of 134MAF for 2025. The facts negate this assumption. A comparison of productivity of two major food crops, wheat and rice shows that the productivity increased 29 per cent and 23 per cent respectively during the period 1997 to 2009 (as per Federal Bureau of Statistics). If it is assumed that half of this productivity increase was due to non-water means, the figure drops to 14.5 per cent and 11.5 per cent respectively. Given that Pakistan is seriously lagging behind in agricultural productivity and there is substantial room for improvement a figure of 25 per cent may be achieved by 2025. 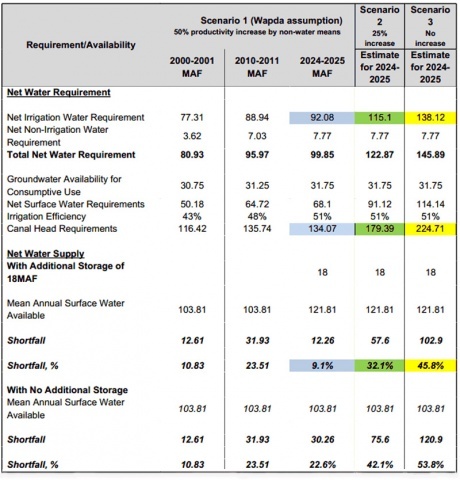 Irrigation efficiency of 51 per cent has been assumed for all the three scenarios. Also, 18MAF of storage availability is assumed for all cases. 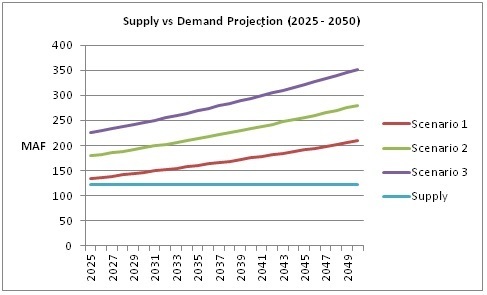 Scenario 1 in the table below provides the exact calculation used by Wapda to develop the forecast demand for 2025. The figures above indicate that even in the most optimistic (Scenario 1), the figures for supply and demand indicate a deficit of 12MAF (9 per cent) by 2025 and 87MAF (42 per cent) by 2050. The situation becomes much worse for Scenarios 2 and 3 where the deficits for 2025 are 32 per cent and 46 per cent respectively. The respective shortfalls for 2050 reach 56 per cent and 65 per cent. The above analysis is confirmed by UN statistics that Pakistan is already facing “Water Stress” and will face “Water Scarcity” by 2035. The term “Water Stress” means that per capita water supply is below 1700 cubic meters while “Water Scarcity” means that per capita water supply is below 1,000 cubic meters. Water scarcity can lead to severe food shortages and thus famine and starvation. 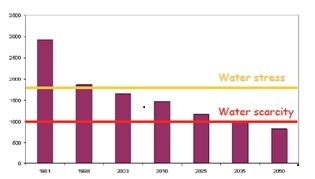 The figure below shows the availability of water (in cubic meters) vs. time. In addition to the above mentioned issues relating to shortage of water, climate change may have a very significant impact on the water flow in the Indus Basin. It is forecast that initially there would be flooding of the rivers due to increased glacier melt that would cause serious damage to the land and the irrigation system. Later, as the glaciers have melted, a draught situation would develop due to lack of water in the rivers. On the supply side, it is essential that the river flows in the Indus, Jhelum and Chenab are not interrupted or reduced by India. Pakistan has to stay on top of this issue and make it a national priority to have a strategy and a team of legal experts to deal with India on the water issue at bi-lateral and international levels. Additional water can be made available by reducing system losses and increasing storage capacity. Better management of groundwater resources is required for maintaining the current level of supply. The cost-benefit ratio of reducing supply losses by lining the canals to prevent seepage should be studied, keeping in mind that if more surface water is available, the cost of constructing tube wells and the associated cost of electricity for pumping is reduced. In order to increase the storage capacity of the reservoirs, a cost-benefit study of de-silting the existing reservoirs (Mangla and Tarbela) should be carried out. One cause of silting is the loosening of earth due to excessive de-forestation. Pakistan had a forest cover of 6 per cent in 1947 but is now reduced to the alarming level of just 2 per cent. International standard recommend a forest cover of 25 per cent to maintain a good ecological balance. A legislation protecting the forests needs to written and then strictly implemented. Starting construction of new dams is critical since the typical construction duration of large dams is 10-15 years. These new projects could be a mix of large, medium and small dams. On the demand side, there is potential to reduce water requirement by taking measures to increase the per acre yield of the crops and improving water usage to crop output ratio. The feasibility of modern techniques, like drip irrigation and sprinkler system, should be looked into. So far, it appears that these techniques may not be suitable for large scale farming in a technologically under-developed country like Pakistan. However, there is good potential for using drip irrigation in small scale farming like fruit farms. Also, replacing of water intensive crops with low water usage crops should be seriously reviewed and the results implemented. There are a myriad of publications by the government, NGOs, and international organisations that have indicated the serious water issue facing Pakistan. However, so far, the government has chosen to take the classic “head in the sand” approach to this matter of life and death. It is high time that serious analysis and planning is carried out to avoid bringing the water problem to the same scale as the power problem is today. Urgent measures need to be taken in order to avoid a drought-like situation in the near future. These measures need to address issues of both water supply and demand; otherwise nature will take care of the problem through a major reduction in population through famines and wars over limited food supplies.